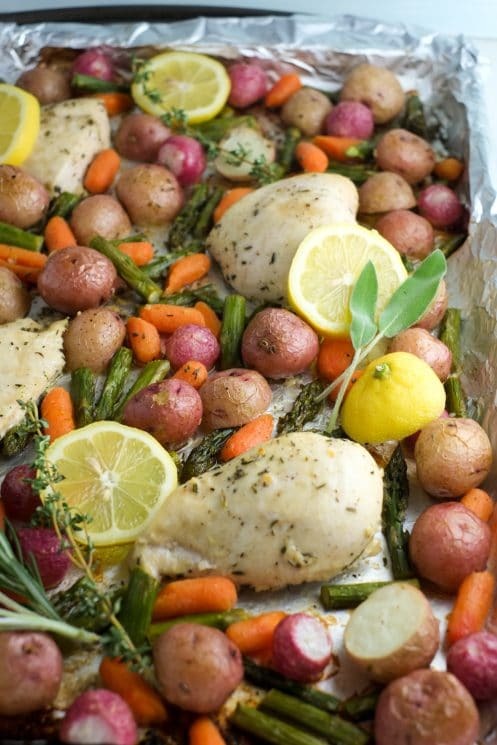 A one-dish chicken dinner wonder featuring fresh spring veggies! 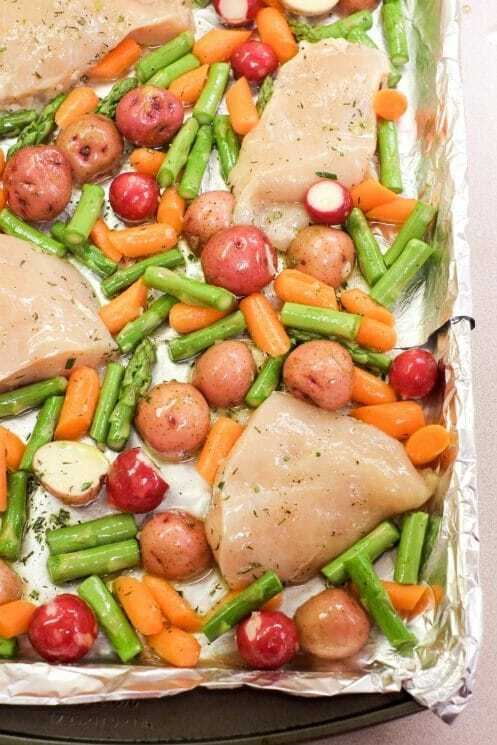 Grab your sheet pan and work up an appetite for this quick and easy family dinner. 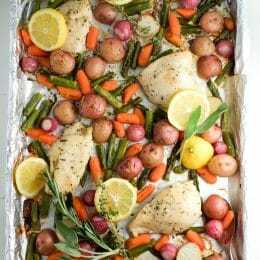 Sheet pan chicken and spring veggies is simple, filling, and fresh. Sheet pan meals are pretty amazing. They’re like one-pot meals, only you don’t have to stand there stirring. Less cleanup, less fuss! 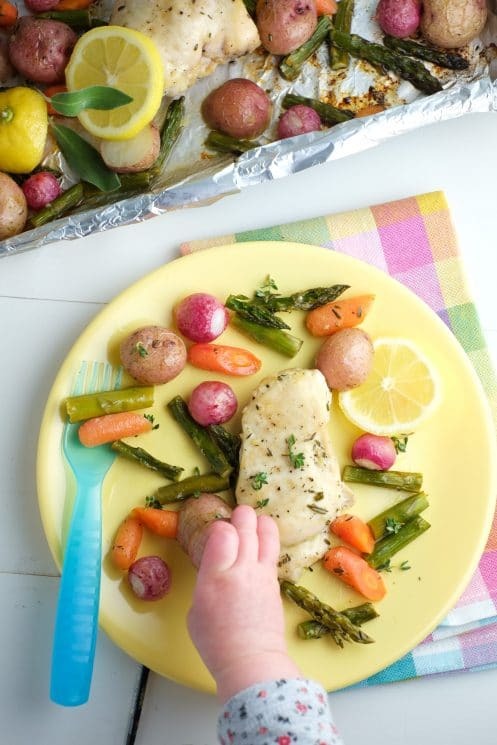 We’re also in love with seasonal vegetables right now: asparagus, radishes, carrots, baby potatoes. All the fresh, new life and lovely flavors. So naturally, we had to make a sheet pan dinner featuring them. First of all, everything can be prepared ahead of time and thrown together in literally 1 minute at dinner time. Then it bakes for 30 minutes and dinner is on the table in a snap! Easy weeknight chicken dinner. Second, the ingredients are simple. Chicken, veggies, and a dressing made from common ingredients: olive oil, lemon juice, garlic, a few herbs, and salt and pepper. And it’s really delicious in its simplicity! And possibly most importantly, this meal provides your family with balanced nutrition without any fuss. 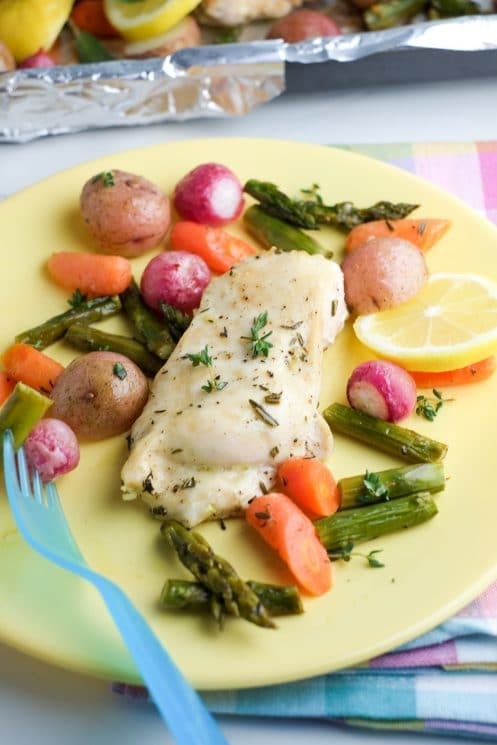 Chicken breasts provide lean protein, veggies pack in fiber and vitamins and minerals, and potatoes add a bit of healthy starch. Plus, olive oil is a heart healthy fat that helps all this great nutrition get well absorbed. First, preheat your oven to 425* F. Now mix up your marinade. In a bowl (or glass measuring cup for me), whisk together 1/3 cup olive oil, 1 tablespoon lemon juice, 2 cloves of minced garlic, 1/2 teaspoon dried thyme, 1/2 teaspoon dried rosemary, 1/4 teaspoon dried sage, 1/2 teaspoon salt, and 1/8 teaspoon pepper. Pour half into a small bowl to reserve for later. Cut two large chicken breasts in half and place in the whisking bowl with half the marinade. Allow to sit for as long as you’re chopping veggies. Or, if possible, allow to marinate in a container or ziplock bag for a few hours or overnight. Chop veggies into bite-sized pieces. Cut the bottom inch off of the asparagus to get rid of the toughest part and toss it, then chop the rest into 1-inch pieces. I used baby carrots and just cut them in half to avoid extra work peeling and chopping carrots, but you can use full-sized carrots cut up into chunks too. Cut the baby potatoes in half if larger than bite-sized. Also cut radishes from their stems. 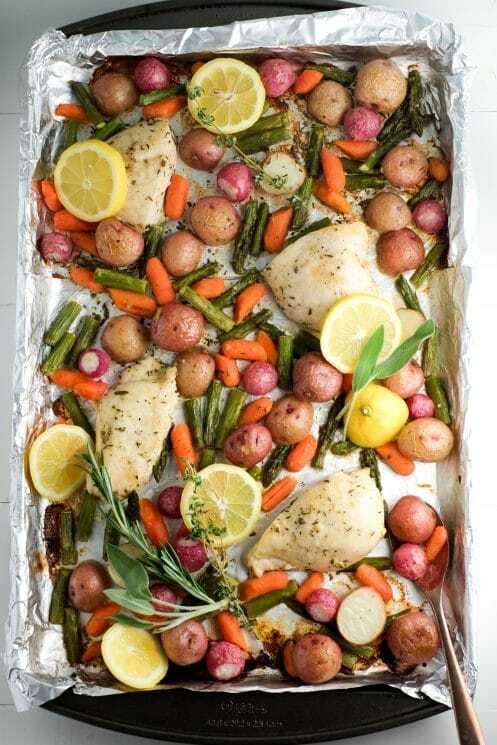 When ready to bake, toss veggies onto a large sheet pan and spread evenly. Pour the set-aside marinade over all the veggies and toss to evenly coat. Now add the chicken, including any extra marinade. 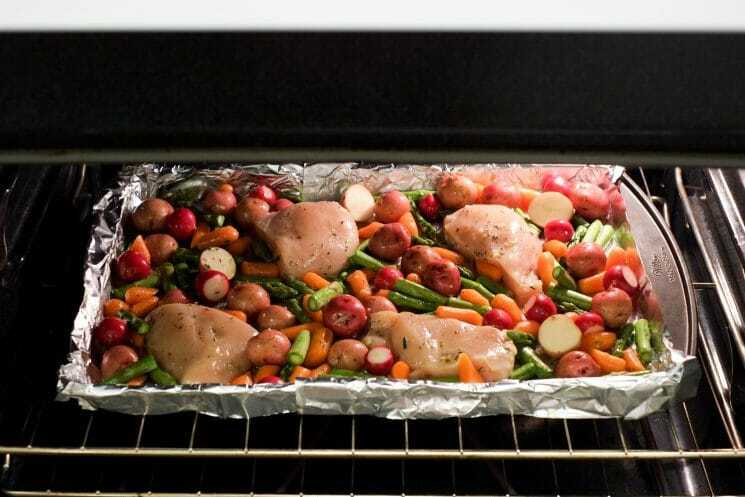 TIP: cover the sheet pan in foil for the easiest clean up! Bake at 425* F for 30 minutes, checking and stirring halfway. Serve warm, or save for a few days worth of lunches! Whisk together marinade ingredients in a small bowl (olive oil, lemon juice, garlic, herbs, salt and pepper). Set aside half the marinade. Cut the two chicken breasts in half and toss them with half the marinade. Allow to marinate as veggies are chopped, or prep ahead and allow to marinate for up to a day for optimal flavor. 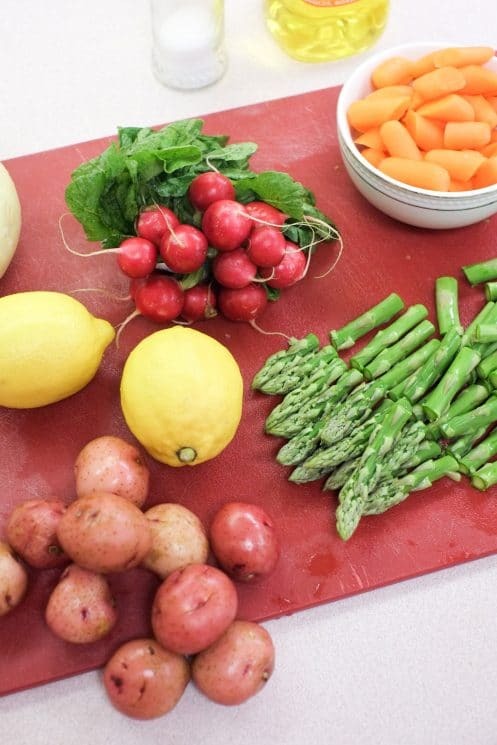 Wash and chop veggies: discard the bottom inch of asparagus, then cut the rest into 1-inch pieces. Remove radishes from bunch. Peel and chop carrots into bite-sized pieces (or cut baby carrots in half). Cut any potatoes larger than bite-sized in half. 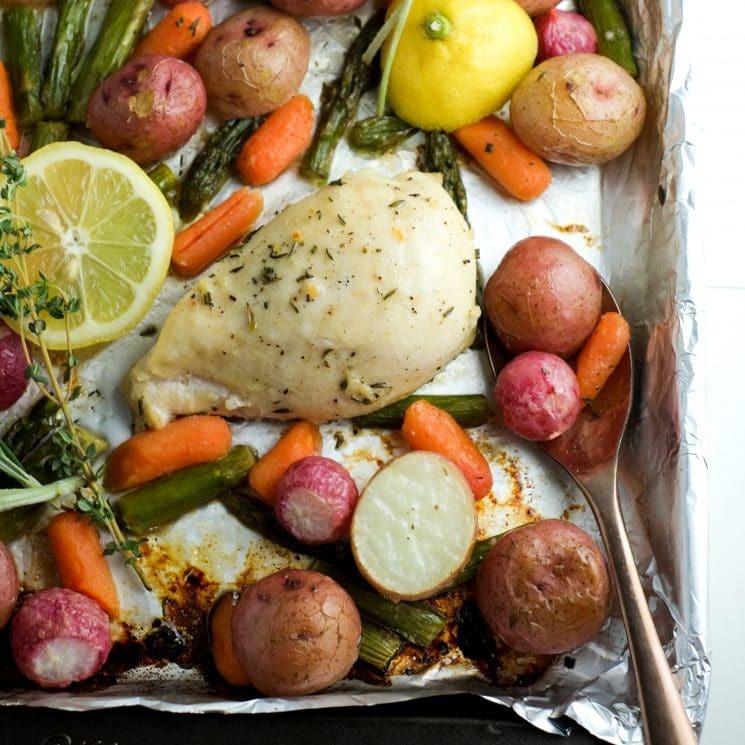 When ready to bake, add veggies to the prepared sheet pan and toss in the reserved marinade. Add chicken. Try to space all items evenly on the sheet pan. Bake for 30 minutes, checking and stirring halfway. If I were to use chicken tenders instead of breasts would you add them halfway through? Hi Jennifer! I haven’t tried this personally, but since tenders are smaller, I think adding them halfway through is a good idea. Just make sure your chicken reaches an internal temperature of 170 before you pull the sheet pan out of the oven.